We’re exploring digital church this month, and social media is one of the ways ministry can happen online. That’s right: Social media can be ministry and not mere marketing. So we talked with Beau Coffron about social media at Life.Church. 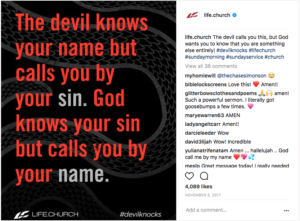 Beau is the social media director for Life.Church, a multi-site Christian church meeting in 29 locations across nine states and globally at Life.Church Online. Beau lives in Edmond, Okla., with his wife and their three children. You can connect with Beau on Twitter. Ministry doesn’t just happen on the weekend. There’s always talk of using social media for conversation, not broadcasting, to share inspiration, not information. How is Life.Church doing that? One of the things we say at Life.Church is that we want our social media channels to be a coffee shop that people hang out in, not a billboard that people drive by. People are constantly bombarded with ads, and as a society, we’ve been conditioned to scan quickly and keep scrolling. We want to create conversational posts that will stop the scroll. We ask our followers to respond to questions based on the weekend message, a worship song, or even a national holiday. We mix serious and funny questions to continually engage our followers. We share encouraging or funny posts from other accounts that align with our culture and will appeal to our followers. We share stories about people in our church often. These stories don’t have to be long. They’re usually a couple paragraphs about how God has changed their life, why they love serving, or the impact a LifeGroup has had on their life. 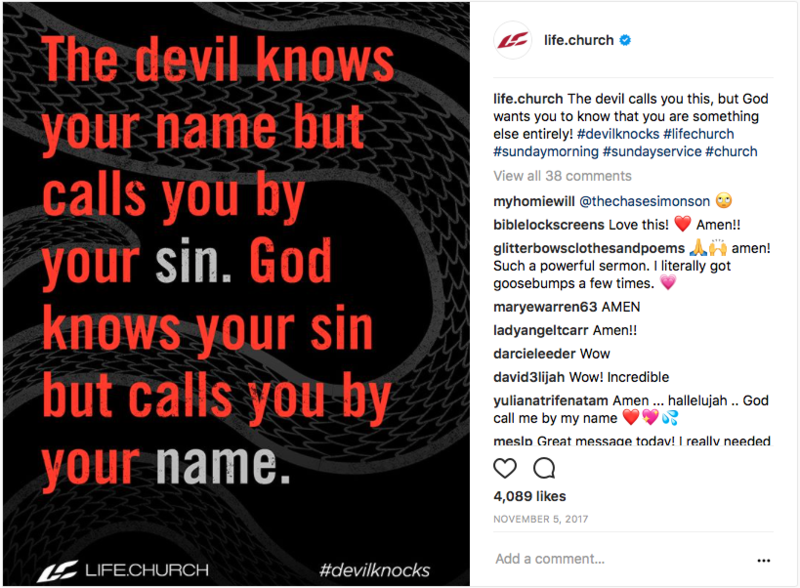 We often think of social media as another marketing channel, but how does it function as a place for church to happen? Do you have some examples of that? Every week, on the same night of the week, we publish a post that simply asks, “How we can pray for you?” What makes this a ministry opportunity, and not just a way to get more social media comments, is that we have a Prayer Team assembled to pray for and respond to every prayer request we get—in real time. This often leads to an ongoing conversation between our team and the person who commented. 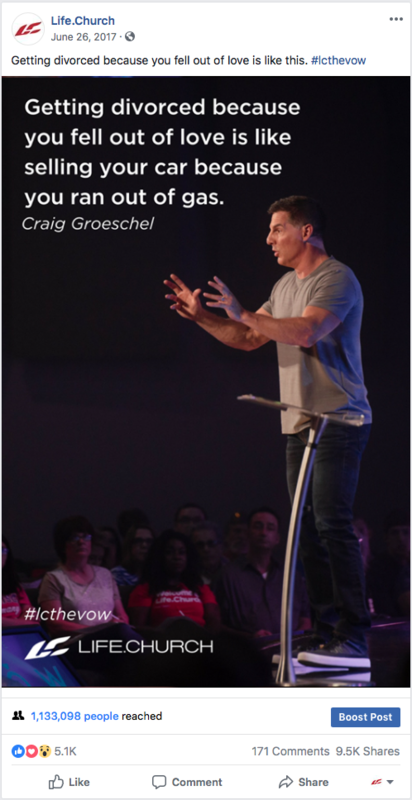 We get the opportunity to encourage them and help them get plugged into community at one of our physical locations, Life.Church Online, or a local church in their area. 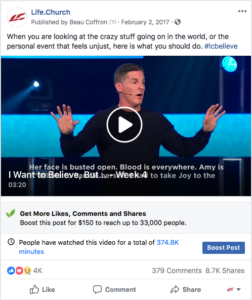 We also do Facebook Live and YouTube Live services each weekend, but the goal isn’t to broadcast the sermon. Our Church Online team provides a live host team that engages with people attending the service, answers their questions, and responds to every person who comments. Through conversations with live attenders, they come to understand we care about them and what they’re going through. We’re developing a relationship in order to speak love and truth into their lives over time. 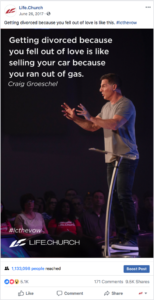 Some of our most popular posts feature video clips and quotes from our weekend messages. So much of what people see on social media can be negative, but we can offer a counter narrative by bringing hope, encouragement, and teaching moments into their feed. Our hope is that this reminds them of what they learned on the weekend or prompts them to seek out the full message. Throughout the week, we also use social media channels to continue the real-life conversations people are already having in our church lobbies on the weekend—from the latest viral video to the hashtags that are trending. When it organically fits who we are as a church, we’ll jump in and join the conversation. These surface level conversations are easy places for people to connect with us, which we believe can lead to building deeper relationships. 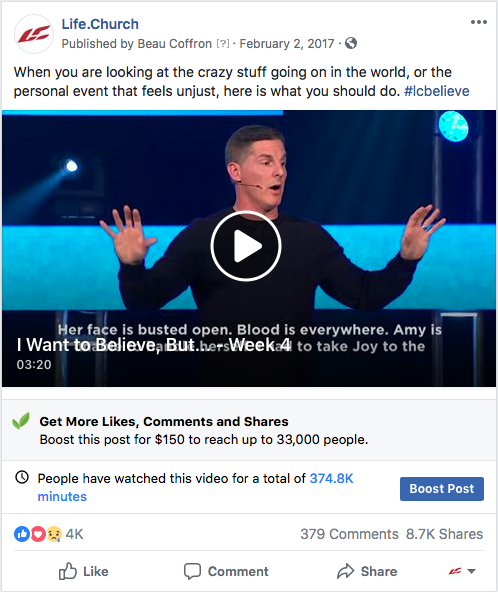 Our hope is that when people engage with these posts, they will also start seeing more spiritual posts, which will open the door for more ministry opportunities. 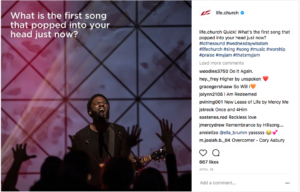 How can churches get their overworked ministry leaders to see social media as a ministry opportunity and not just a communication channel? It’s easy to get right to the tactics when it comes to social media, but backing up to cast vision is so important. First, people have to understand the why before the what. There are 1 billion active monthly users on Instagram and 2 billion people on Facebook. It can be hard to wrap our minds around that, but our mindset changes when we make the connection that these aren’t just numbers. They’re real people in our community. You can help leaders think about it this way. If you’re in a restaurant and have the chance to talk to someone about your faith, would you avoid the conversation just because of where you are? No, I bet you’d jump at the opportunity to talk about God in the moment! Social media is ripe with ministry opportunities when you have eyes to see them. At Life.Church, we’ve prioritized our social media strategy because it’s a part of our mission to lead people to become fully devoted followers of Christ. Ministry doesn’t just happen on the weekend. We want to we meet people where they are and where they are throughout the week. And what better place than where the average person spends over an hour a day? We want to create conversational posts that will stop the scroll. In some ways, I think people can be willing to share more when they’re behind a screen than they normally would in person. We’ve found people feel free to be themselves and open up about what’s really going on in their lives when they’re not face-to-face with someone else. Social media platforms also give us the opportunity to click on a person’s profile to get a better window into who they are. We’re able to use that insight to help meet their needs more effectively. 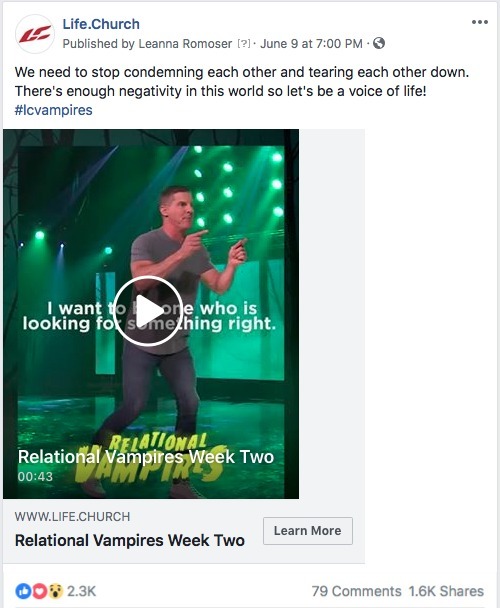 For example, when it becomes apparent that a person has needs beyond what our social media team can handle, we are easily able to connect them with a pastor at a physical Life.Church location or Life.Church Online. I believe the most powerful part of beginning a relationship online is that we can serve them well in the moment. We can pray for them, give them immediate access to helpful resources, or even just share a laugh with them. When used strategically, I believe social media can actually break down barriers and help ministry happen more quickly. Need help figuring out how to do church online? We’re exploring digital church for all kinds of churches, whether you’re doing full-on live streaming and have a social media pastor like Life.Church, or if you’re just getting started. We can help.